The objectives and targets of Papua’s regional development in the period 2015-2019 are to encourage the acceleration and expansion of Papua’s development to improve the quality of life of the people of Papua through the acceleration and expansion of development that emphasizes the superiority and potential of the region based on unified custom. (a) Fulfilling basic needs and sustainable survival, as well as equal distribution of affordable, qualified, and viable education, health and housing services. (b) Development of sustainable economic independence based on territorial custom especially in Papua Province through development of small and medium industries in local commodity based agriculture, such as cocoa, coffee, red fruit, rubber, sago, coconut, peanut, yam, vegetables and fruits, as well as non-local commodities such as rice, corn, soybeans, and sugarcane. Development of plantations and non-food crop agriculture such as sugarcane, rubber, and palm oil; cattle and pig breeding; maritime development such as fishery industry and marine tourism; development of cultural and environmental potentials, namely cultural tourism, natural reserves and national parks; and the development of downstream oil, gas and copper commodities. (d) Continuous improvement of human resources and science and technology. In order to accelerate and expand the economic development of Papua Region, economic growth centers will be developed by utilizing the potentials and superiority of the region, including the development of 2 (two) special economic zones, 1 (one) industrial estate, the development of 5 (five) custom areas and centers of economic growth of other suburbs. In the meantime, to reduce the gap between regions in the Papua Region, the development of underdeveloped regions with the target of 9 (nine) lagging districts can be achieved with outcome targets: (a) increasing the average of economic growth in underdeveloped regions to 9.5% in 2019; (b) a decrease in the percentage of poor people in disadvantaged areas to an average of 22.63% in 2019; (c) an increase in the Human Development Index (HDI) in disadvantaged areas by an average of 61.40 in 2019. To encourage the growth of urban development in Papua, optimizing the role of 2 (two) medium-sized autonomous cities as the center of economic growth, primary service centers and hubs for Papua and Maluku Islands in the form of a National Activity Centers (PKN) as well as supporting development of the border areas of the country. In accordance with the mandate of Law 6/2014 on Villages, rural development is aimed at reducing the number of villages left behind by at least 340 villages or increasing the number of independent villages of at least 140 villages. Improving rural-urban linkages by strengthening 4 (four) growth centers as a Regional Activity Center (PKW) or Local Activity Center (PKL). In order to realize the border area as the front page of a sovereign, competitive and secure country, 3 National Strategic Activities Center (PKSN) will be developed as a center of economic growth in the border areas of ​​the country that can encourage the development of the surrounding areas. The increase in the implementation of regional autonomy in the Papua Region is indicated by: (a) Increase in the proportion of regional tax and retribution revenue by 10% for the province and 7% for districts / municipalities; (b) Increase in the proportion of capital expenditure in the provincial APBD by 35% and for districts / cities by 35% by 2019 as well as other sources of financing in the APBD; (c) Increase in the number of regions receiving unqualified opinion (WTP) of 2 (two) provinces and 20 districts / municipalities in the territory of Papua; (e) Increase in the quality and proportion level of the education apparatus of the area for S1 level by 50% and S2-S3 by 5%; (f) Implementation of regional leadership training and training on development management, population, and regional finance throughout the Papua region by 30 batches; (g) Implementation of special autonomy evaluation and improvements to the institution, apparatus, and funding of the implementation of the special autonomy; (h) Implementation of planning and budgeting synergy in Papua (with Papua Province as initial project); (i) Increase in the implementation of SPM implementation in the regions, particularly on education, health and infrastructure; (j) Increase in the percentage of PTSP amounting to 40%; (k) Implementation of central and local coordination through enhancement of the role of the governor as a government representative; (l) the implementation of an on-line transfer monitoring and evaluation system in Papua; (m) Implementation of institutional strengthening of the Agency for the Acceleration of Development of Regions of Papua and West Papua. The objective of disaster management in Papua Region is to reduce the Disaster Risk Index in 10 target districts (Jayapura City, Sorong City, Manokwari City, Merauke Regency, Sarmi, Yapen, Nabire, Raja Ampat, Teluk Bintuni and Biak Numfor) with high disaster risk, both functioning as PKN, PKW, Industrial Estate and other growth centers. 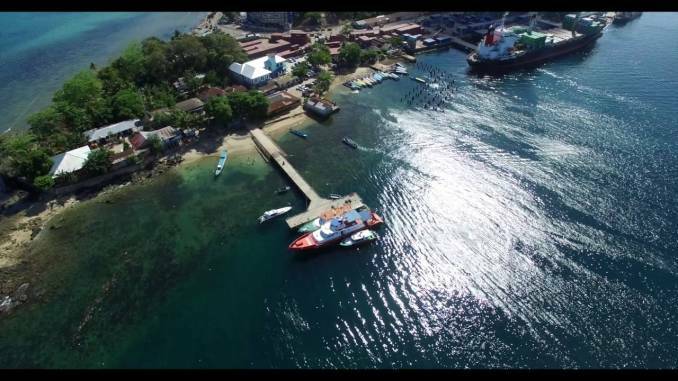 In connection with these objectives, it is expected that by the end of 2019, the development of the Papua Region will increase. This is reflected in the increasing contribution of Papua Regional GRDP to GDP, from about 1.9% (2013) to 2.6% (2019). Thus, the condition is expected to improve the welfare of the people in the Region of Papua.